Norfolk, Cosy Beamed Cottage Close Sandy Beaches/Broadland. Peaceful Location. Property 2: Norfolk, Cosy Beamed Cottage Close Sandy Beaches/Broadland. Peaceful Location. Property 11: Traditional Brick & Flint Norfolk cottage, 2 mins from beach and local pub! Well-appointed, spacious 3 bedroom riverside cabin in tranquil Norfolk Broads. 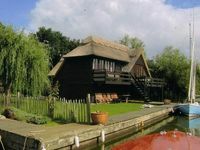 Property 22: Well-appointed, spacious 3 bedroom riverside cabin in tranquil Norfolk Broads. Modern Newly Refurbished Detached House. Short Walk To Beach. Property 25: Modern Newly Refurbished Detached House. Short Walk To Beach. Charming one bedroomed converted boathouse overlooking Broad, Ranworth. Property 26: Charming one bedroomed converted boathouse overlooking Broad, Ranworth. Beautifully furnished, comfortable holiday cottage close to a huge sandy beach. Property 43: Beautifully furnished, comfortable holiday cottage close to a huge sandy beach. EASTER WEEKEND AVAILABLE! - Enquire for price. Detached, Pet Friendly Cottage. Property 47: EASTER WEEKEND AVAILABLE! - Enquire for price. Detached, Pet Friendly Cottage. Our stay at the boathouse was the most unbelievable experience I have ever had. The house was beautiful and was nice to feel in the comfort of a house with a meaning behind it. The scenery from the house was stunning. Coming from a city to here makes everything else in the world feel irrelevant. I could recommend this place endless times, you get so much more for your money than just a stay at the boathouse, everything else that comes with also is great.